"We are creating images whose reality is self-evident and which are devoid of the props and crutches that evoke associations with outmoded images, both sublime and beautiful...The image we produce is the self-evident one of revelation, real and concrete, that can be understood by anyone who will look at it without the nostalgic glasses of history." Color Field Painting is a tendency within Abstract Expressionism, distinct from gestural abstraction, or Action Painting. It was pioneered in the late 1940s by Mark Rothko, Barnett Newman, and Clyfford Still, who were all independently searching for a style of abstraction that might provide a modern, mythic art and express a yearning for transcendence and the infinite. To achieve this they abandoned all suggestions of figuration and instead exploited the expressive power of color by deploying it in large fields that might envelope the viewer when seen at close quarters. Their work inspired much Post-painterly abstraction, particularly that of Helen Frankenthaler, Morris Louis, Kenneth Noland, and Jules Olitski, though for later color field painters, matters of form tended to be more important that mythic content. Color Field Painting emerged out of the attempts of several artists in the late 1940s to devise a modern, mythic art. Seeking to connect with the primordial emotions locked in ancient myths, rather than the symbols themselves, they sought a new style that would do away with any suggestion of illustration. The style was championed most enthusiastically by critic Clement Greenberg, who acclaimed the advances it achieved in the realm of form and composition. Bemoaning what he saw as the increasingly imitative, academic qualities of some action painters, he argued that Color Field Painting represented the way forward. His advocacy of the style proved highly influential. Color Field Painting marks a major development in abstract painting, since it was the first style to resolutely avoid the suggestion of a form or mass standing out against a background. Instead, figure and ground are one, and the space of the picture, conceived as a field, seems to spread out beyond the edges of the canvas. 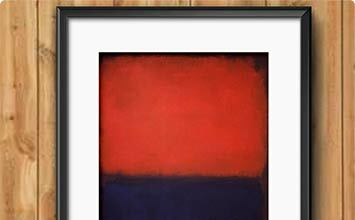 Rothko, Newman, and Still were all independently moving in the direction of color field abstraction in the late 1940s. Still is generally acknowledged as having achieved it first with a series of paintings he exhibited in 1947, but Newman was also important in making early theoretical contributions to the style. In the same year he organized an exhibition for Betty Parsons Gallery entitled The Ideographic Picture, which gathered together artists such as Mark Rothko, Clyfford Still, and Hans Hofmann, and pointed to the development in recent American art of a "modern counterpart of the primitive art impulse." It was summed up in the concept of the ideograph, which he described - quoting a dictionary - as a "character, symbol or figure which suggests the idea of an object without expressing its name." Newman was searching for an abstract art that might do away with all figurative or quasi-figurative motifs. An abstract form could be a "living thing," he wrote in the exhibition's influential catalogue essay, "a vehicle for an abstract thought-complex." It would be more real and present than a form that was merely abstracted from nature or an object. There used to be some disagreement over which artist had first arrived at the style of Color Field abstraction. Most now believe that it was Clyfford Still who first did so - and at some remove from those in New York, such as Barnett Newman and Mark Rothko, who were also finding their way to the approach in the late 1940s. In this examplary work Still applied thick portions of color with a palette knife to achieve an effect that evokes a violent sundering in nature. Typically, Still's canvases were covered in rich earthy colors, from edge to edge. Although Rothko never considered himself a Color Field painter, his signature approach - balancing large portions of washed colors - matches up to critics' understanding of the style. Rothko considered color to be a mere instrument that served a greater purpose. He believed his fields of color were spiritual planes that could tap into our most basic human emotions. For Rothko, color evoked emotion. Therefore each of Rothko's works was intended to evoke different meanings depending on the viewer. In the time No. 2, Green, Red and Blue was made, Rothko was still using lighter tones, but as more years passed and Rothko's mental health increasingly declined, his Color Fields were constituted by somber blacks, blues, and grays. Helen Frankenthaler played a crucial role in the evolution of Color Field Painting. Some time in or around 1952, Clement Greenberg invited Morris Louis and Kenneth Noland to pay a visit to Frankenthaler's studio in order to witness her technique of staining untreated canvas with paint. This seminal moment marked a turning point for Abstract Expressionism, and soon this new group of artists were simplifying the painting process by applying large bands (or waves, circles, lines, etc.) of uniform color to the canvas, and Color Field Painting advanced further. Kenneth Noland is often known for his exacting symmetry. Throughout his career he shifted from targets to chevrons to stripes, and experimented with many other styles in between (most notably the shaped canvas), but he always maintained a visual balance to his work. In East-West, Noland exercised his signature chevron style, and it is one of the many paintings in which the artist sought to achieve effects by marrying colors to simple, geometric forms. As he matured, and his color vocabulary changed, Noland increasingly covered the entirety of his canvases with paint, to the point where his lines and colors seemed infinite, and achieved what Greenberg suggested when he wrote: "capable of repeating the picture beyond its frame into infinity." Mark Tobey is one of the lesser-known Abstract Expressionists. Upon first glance, Advance of History almost appears as a tightly wound version of a Pollock "drip" painting. Upon closer inspection, however, an almost decorative pattern emerges that was not prevalent in Pollock's work. Throughout his career, Tobey was renowned for his experimental nature, frequent travel, and fascination with Eastern art and philosophy. As a student of Haiku, Zen, and Japanese calligraphy, among other things, Tobey often took natural forms and elaborate script as his inspiration, and relied on patterns in his paintings as a way of channeling his communion with the natural world. By 1970, Color Field artists like Frank Stella, Kenneth Noland and the late Morris Louis had long established their style as the next phase in modern abstraction. Stella in particular was best known for his Color Field spectrums, in which bands of varying colors were situated in such a way as to render the canvas a three-dimensional field of pure color. What made these paintings unique, and thus a distinctive characteristic of most Color Field work, was the absence of any representation or figurative forms. In Metropolitan Museum of Art 1870-1970, commissioned by the museum for its 100th anniversary, Stella carefully balanced alternating color bands to create a visual plane and framed this plane within a field of primary blue.